Who doesn't love a good taupe? After brown, for me it's the perfect shade of shadow. I purchased Mally Beauty Shadow Stick in Over the Taupe some time last year, thinking it was the one I had seen her demonstrate on QVC. Maybe it was, maybe it wasn't (I think it was though). I remember it being so sparkly and pretty. Of course, that's how QVC works, right? Either way, I am a happy camper with this purchase! I got it on sale over Black Friday at 50% off the regular price of $25.00, so I ended up paying only $12.50 for it. I also purchased her limited edition set for $39.00 earlier on, which was a great freakin' deal for five full-sized shadow sticks. The set came with: Bliss, Brownstone, Mahogany, Moonlight, and Timeless Taupe. Timeless Taupe is the only one that isn't part of the permanent collection. I have oily lids. It's pretty hard for any shadow to last all day on my lids without primer. Shadows I have the most success with are: ABH Master Palette by Mario, Urban Decay Naked and Naked 2 Palette, Sephora Shadow Liner and Pencil, Armani Beauty Eye Tints (review coming soon), and Charlotte Tilbury Eyes to Mesmerise. You can literally achieve a beautiful eye look in 2 minutes with these pencils, whether it's just swiping one color across the lid, or using more than one of these at a time. 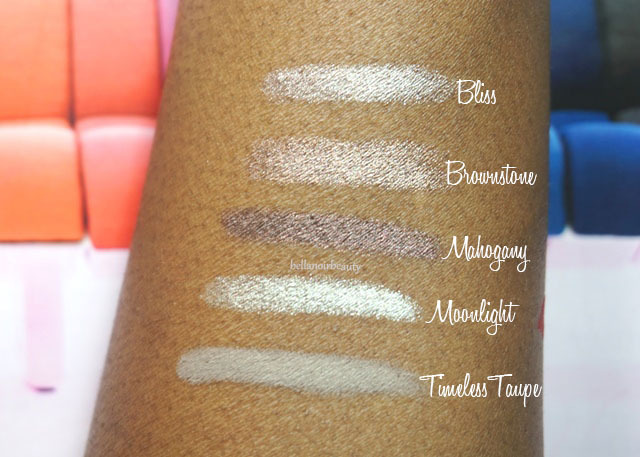 I have even used Bliss and Moonlight as a highlighter and they are beautiful. Yes to multitasking! When I swatched these, I was very happy to see that they are the shadows that dry down quickly, like this one from Kiko, this one from Make Up For Ever, and the Sephora Shadow Liner and Pencils. They don't budge after application. However, on their own, they crease on my oily lids after about six hours. With primer, these last me over 10 hours. On a scale of 1-10, the joy factor on these shadow sticks are a 9! While I admit that without primer, these crease up a storm, but I love the versatility of them and I really enjoy using them.